Cactus pears are actually large berries growing on the prickly pear cactus. They are filled with edible seeds – which is one reason for their high-fiber content – and brightly-colored, antioxidant-rich juice. You can eat the fruit raw or cook it for jams, preserves, pies and other desserts. One cactus pear with the stem end and skin removed contains 42 calories, 9.86 g of carbohydrates, 0.75 g of protein, 0.53 g of fat and 3.7 g of fiber. Each cactus pear has 14.4 mg of vitamin C, 0.014 mg of thiamine, 0.062 mg of riboflavin, 0.474 mg of niacin, 0.062 mg of vitamin B-6, 6 mcg of folate, 44 international units, or IU, of vitamin A and 26 mcg of beta-carotene. 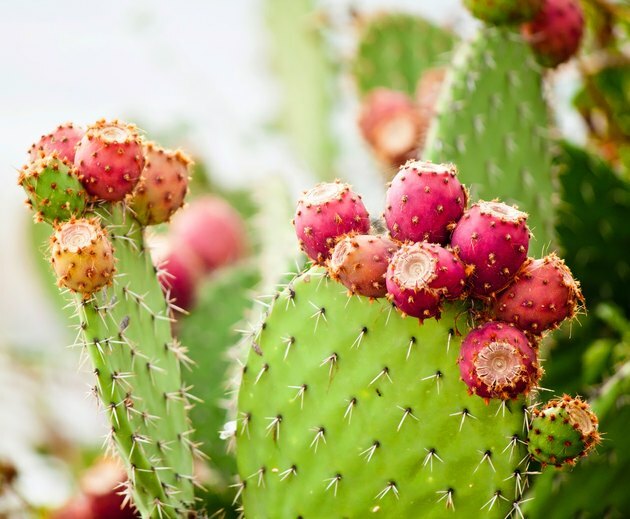 A single red cactus pear fruit contributes more than 5 percent of the daily requirement for calcium – with 58 mg. It also contains 0.31 mg of iron, 88 mg of magnesium, 25 mg of phosphorus, 227 mg of potassium, 5 mg of sodium, 0.12 mg of zinc, 0.082 mg of copper and 0.6 mcg of selenium. Although the cactus pears available for sale in your local grocery store have been mechanically stripped of their needles, some invisible stinging hairs are likely to remain. Before you handle the prickly pear, put on protective gloves or use tongs to hold the fruit while you cut away the peel. How Many Calories Are in a Red Delicous Apple?